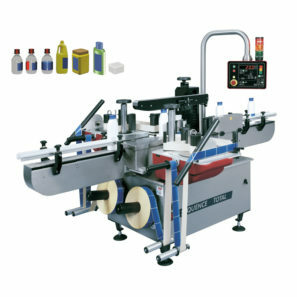 Automatic Labelling Machine – Sequence Total is an easy to operate labelling machine with label counter and pre-set batch controls, keyboard and digital display suitable for a range of cylindrical labelling applications. It has stepper motors for fast and accurate labelling and front and rear labelling heads for optimum label placement with wrap round, oval and multi panels applications with opaque label detection as standard, also easily adjustable pre-dispensing and label positioning with graduated scale. Front and rear labelling heads for optimum label placement. With wrap around, oval and multi panel placements. Easily adjustable label pre-dispensing and label positioning with graduated scale.